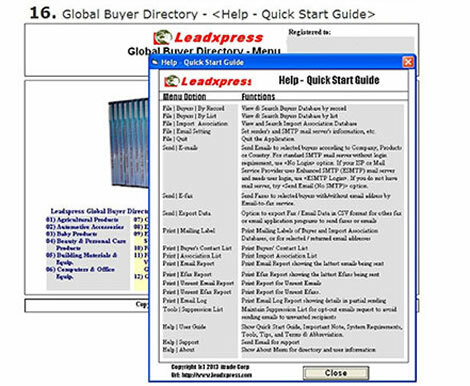 Global Buyer Directory is not only the international buyers and importers directory but also well equip with powerful export promotional tools. It is simple and easy to use. 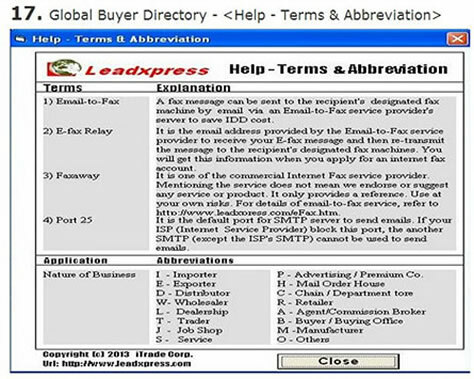 Just a mouse click, you may select different functions on the pull-down menu to print mailing labels and buyer list, export Fax / Email Date in CSV format for other fax or email application programs to send faxes or email., etc. You need not to re-enter the data. The onscreen helps and operation instructions can reduce your time of learning so that you may start your promotion promptly. The (Terms & Abbreviation) explains some terms and abbreviation of the Global Buyer Directory and hence the user can easily understand the programs and get started quickly.